Greg’s video here highlighted a key lesson in trading: Don’t let fear crowd out your chance of success in trading. Ironically, when I watched this over the weekend and saw Greg mention the NZD/USD I couldn’t help but smile because that is exactly what happened to me when I was on a break last week. To cut things short, basically I decided to open a trade while I was off for a trip. It’s something I wouldn’t ordinarily do and it is something I always advise against. But I did it anyway – mainly because it was only a short trip. And I just wanted to share my thought process behind it. I was on the train during my travel and popped open my phone and glanced over some charts. And I saw the NZD/USD hourly chart. The pair had a bit of a spike following earlier in the day but once again failed at a test of the 200-hour MA (blue line) – and more concerning was the fact that the “death cross” formation was starting to be seen. I entered a short position in the pair @ 0.73175. But the most important part about all of this is defining and limiting risk. I am in no position to constantly monitor my trade and I pretty much would not care for it all too much if the trade was a poor one – considering how little time I had to digest it. But as long as my risk is defined and limited, that is okay. I am in control of the fear element of the trade. Now, the kiwi was already one of the poorer performers on Monday and Tuesday when I was around – so in my head it makes sense for a further continuation because nothing has really changed so far. Needless to say, the trade went well and I even scaled out profits at 0.72996¹ and 0.72450². I talked more on scale trading and the psychology of it here. 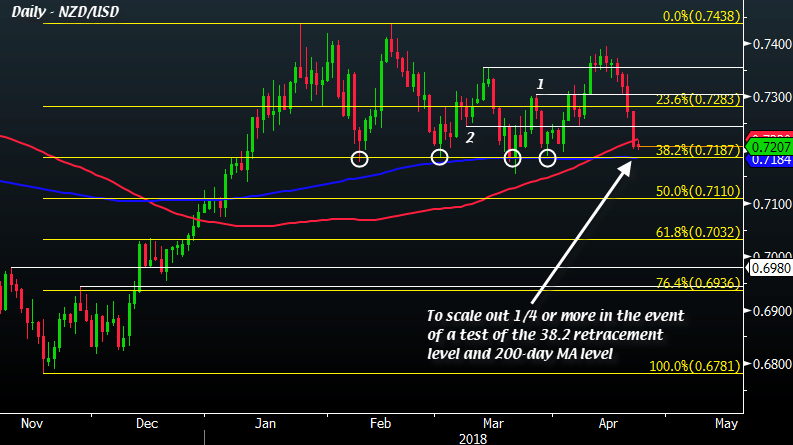 As the pair broke below the 100-day MA (red line) on Friday’s close, it looks set for a test of the 38.2 retracement level again – a key support level. I’ll be looking towards that for my next step of action. Don’t let fear crowd out your chance of success in trading. It wasn’t as though I was away for two or three weeks, so I was still confident in executing the trade. And as long as my risk is defined and limited, there should be no reason why fear should get in the way of me attempting the trade in the first place. And that is no different from any other trading day. If you are of course going off for a long break or holiday, this is something I wouldn’t recommend. My actual advise would be to just detach yourself completely, order a glass of Long Island and kick back under the sun. It’s worked wonders for me in the past and I will do so again when I do actually take a longer break. But this is just to share with you guys my trading thought process in relation to Greg’s educational video over the weekend.